Yet another night in the Super Late Models… yet another winner. Mike Fritts became the fifth different Super Late Model winner in five races during Speedweeks at New Smyrna Speedway, and like many of those before him, he led all 30 laps of the feature and held off a couple of hard charges from behind to capture the win. Fritts has been fast all week long, setting a new track record in qualifying on Sunday. But he has never been able to get the right redraw after qualifying to put him in position to win or he’s be involved in one of the many incidents throughout the week, knocking him back in the field and leaving him with the task of just working his way back to the front. On Wednesday night, Fritts got the pole thanks to the redraw, and that was all he and the Grills needed. “We changed a few things today, regrouped and really got our stuff together and it showed,” said Fritts. “These crew guys have worked their butts off this week. We’ve stayed up a lot of nights working. We’ve lost a few days of testing stuff that we wanted to try just working to repair stuff from other problems we’ve had. That could be bad news for the rest of the field. 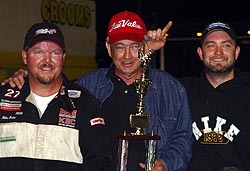 Mike Fritts (left) celebrates his win with Frankie and Augie Grill from Grand American Race Cars. Fritts didn't do a polish victory lap... he just wanted to let the crowd see the good side of the car. “I’ve been running Grill’s cars for years and been associated with him for years, so this has been a dream of mine to run the ‘housecar.’ I know it sounds silly, but it has been, and it is a blast. Ted Christopher came down to Speedweeks as the all-out favorite, along with Donny Lia, in the NASCAR Tour-Type Modified Division. 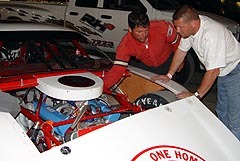 However, with the likes of Mike Fritts, Scott Hantz, Travis Kittleson, Jay Middleton, Justin Drawdy, David Rogers and others, he was kind of lost in the shuffle when it came to thoughts of TC being the man to beat in the Super Late Models. Well, after six nights of racing, Christopher is proving that he is a definite threat and is now THE man to beat. Wednesday’s third-place finish for TC, following his win on Tuesday night, allowed Christopher to pull out to even a bigger lead in the Super Late Model Speedweeks point standings. People didn't think TC and car owner Jay Cushman (right) would work well together. Well, they lead the point standings. “It is down to night number five, so I guess we are doing good,” said Christopher. “We finished ahead of the guys behind us in points so that is good. 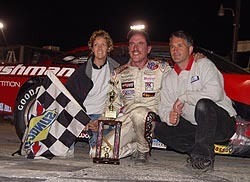 TC has been getting better and better in Super Late Models after breaking out of the box and winning a PASS race in 2004. Since then, he’s been on a roll. TC started outside eventual race winner Mike Fritts on Wednesday night, but a pretty good bump from the Florida veteran kept TC at bay and away from his second win. One night after being involved in one of the “big ones” during the Super Late Model feature, Ohio’s Jack Landis broke out his “backup” car and showed everyone that his spirits aren’t a bit dampened. Landis surprised maybe everyone but himself by earning the top qualifying honors on Wednesday night, then proceed to have a classic battle with Teddy Christopher on his way to a runner-up finish in the 30-lap Super Late Model feature. “We've been waiting to get this car out for a long time,” said Landis, a former full-time ASA driver. 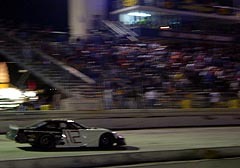 “We come down for the race at Lakeland (SpeedFest) and hurt the engine. We just got it fixed yesterday morning. We took it out for practice to get some hot laps. We needed more laps so we waited and I am glad we waited because we tore up the other car last night and got in the melee. A couple of laps in it today and we ended up with fast time. Second to Fritts… I'd take that any day. Jack Landis works on the engine they jsut got back from the engine shop. “This car now is obviously now our A-car. It's a real hot rod. CRA Super Series regular Eddie Van Meter rolled into New Smyrna near the start of the week with a plan. The plan was to get his #23 out, spend a couple of nights tuning the car and getting it ready for the week’s big 50- and 100-lap races. Well, two consecutive top-five finishes later, Van Meter is looking like he could be a big threat come to the end of the week. “We got a pretty good car. We spent a couple of nights out there just practicing getting ready for the big ones Thursday and Saturday. This has been a common site in Trevor Stewart's pits during Speedweeks. It is pretty odd to hear a driver say that he didn’t want good luck. But sometimes, when things that are so good seem to just always go wrong, wishing for something else is just as important. “We didn’t even want good luck (tonight), we just wanted to get rid of the bad luck,” said Stewart, who has been in the wrong place at the wrong time all week long. “We feel fortunate to actually have the car in one piece. around, trouble seems to be attracted to him and his car. The team has spent many nights just trying to fix the car when they’ve been the innocent victims of accidents. In fact, sometimes, like on Tuesday night during Ryan Mathews’ big accident, even completely missing an accident has been bad luck. Stewart’s outlook on the rest of the week is getting better. Jeff Choquette made his first appearance during Speedweeks at New Smyrna Speedway on Wednesday night. Choquette has spent several nights at East Bay Speedway, racing a Dirt Late Model. Choquette was immediately one of the favorites when he pulled into the track on Wednesday, as he had won the last four races that he’s race in at New Smyrna Speedway, going back to the Pete Orr Memorial earlier this year and the Governor’s Cup last year. Choquette (#70) was back at New Smyrna, but didn't win for the first time in five trips to the track. disappointing seventh. Choquette then quickly left the track and flew back home, having to be a school on Thursday morning. Ryan Foster, who is being helped out by Wayne Anderson this week at Speedweeks, had an eventful night, coming home 16th after having a run in with Scott Hantz early in the race. The two drivers spun together and a few others spun to avoid them, but both Hantz and Foster were able to keep going. However, the cars of Jeff Emery and Mario Maressa retired with damage. Chase Austin, the 15-year-old sensation for SS Racing and Hendrick Motorsports, had his best run of Speedweeks thus far, finishing 17th. Austin’s week has been plagued by accidents and a blown engine. Jason Boyd won his third-straight Limited Late Model race, beating Rich Clouser, Jerry Artuso, Tate Pierce and Chuck Burkhalter to the win.